A World Cup qualifier between Malaysia and Saudi Arabia was abandoned just before full-time on Tuesday because of crowd trouble. 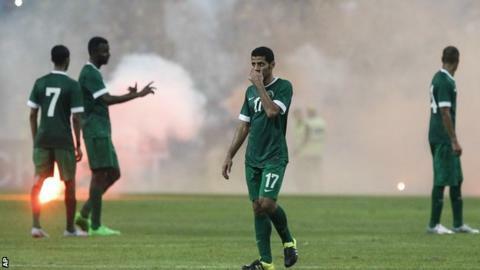 Visitors Saudi Arabia were winning the Group A Asian qualifier 2-1 at Shaha Alam Stadium when flares and fireworks were thrown onto the pitch. "We are extremely disappointed with the events which took place and take such matters very seriously," said the Asian Football Federation. Fifa has not announced any sanctions. The disturbances mean Saudi Arabia could be awarded a 3-0 victory, the host nation fined or ordered to play matches behind closed doors in empty stadiums. Malaysia suffered a record 10-0 defeat by United Arab Emirates last week, which left them bottom of their group and led to Dollah Salleh resigning as head coach. Interim coach Ong Kim Swee had urged fans not to disrupt the game in protest at the UAE result. Meanwhile, Syria - who are playing all their games away from home because of the civil war in the country - won their third straight World Cup qualifying match on Tuesday, beating Cambodia 6-0 in Phnom Penh. Syria, who have scored 13 goals without conceding any, are top of Group E with nine points. The country has never qualified for a World Cup.